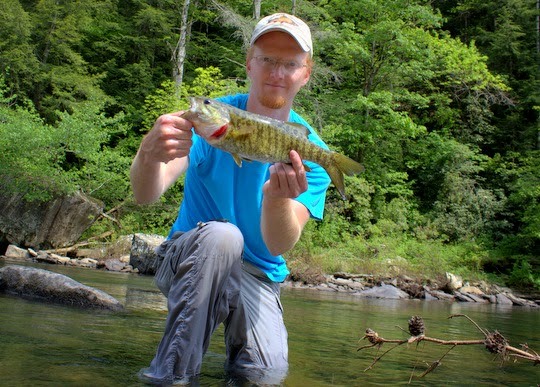 Smallmouth on the Cumberland Plateau are coming on strong now. 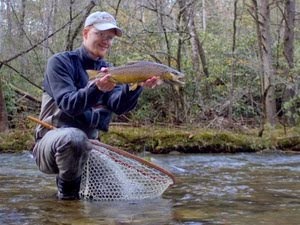 Our weather is always a bit cooler than down in the lowlands so the local fish are not as far along as fish down around Knoxville and Chattanooga. 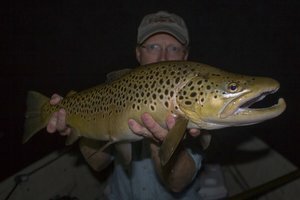 However, with the recent hot dry weather, fishing has improved rapidly and it is time to get out and enjoy the remote creeks and rivers. This past Sunday, after cooking a Mothers' Day breakfast for my mom, I took off for an afternoon of visiting a local favorite. 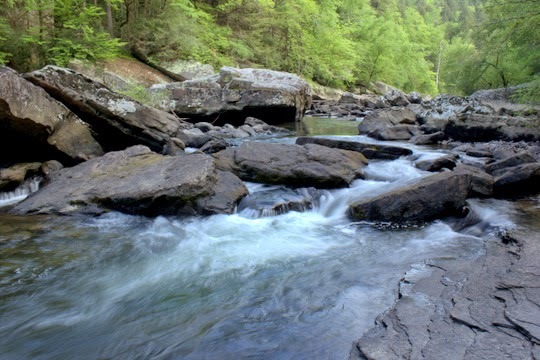 This stream is remote and flows through some of the most rugged terrain in Cumberland County. The plan was to explore a stretch I fish a fair amount and have even guided on occasionally. 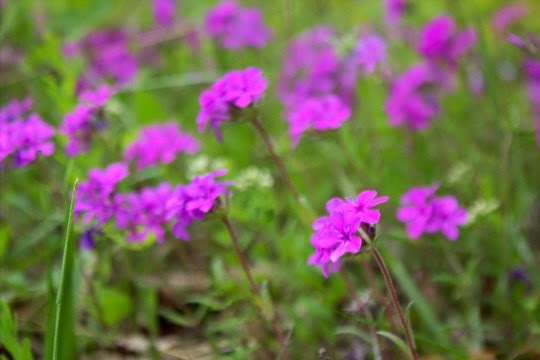 Driving through the country side, I noticed that we are transitioning rapidly to late spring/early summer flowers. 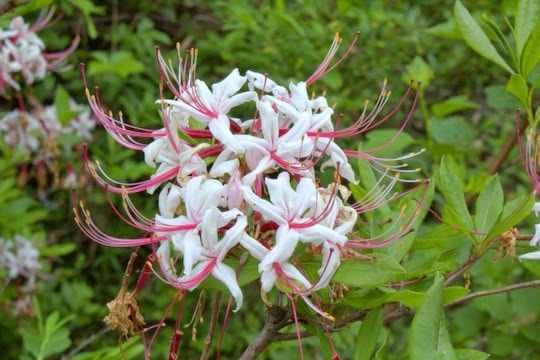 Later, along the stream, I saw that spring favorites like the Pinkster Azalea were just about finished although a few held on in shady spots. The last few blooms on the Pinkster Azalea were beautiful. 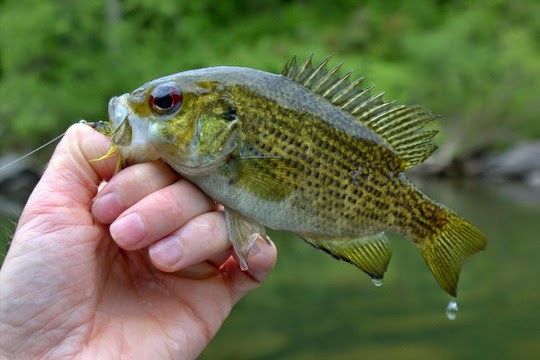 When I started fishing, it became apparent that the rock bass were hungry since I caught several right away. 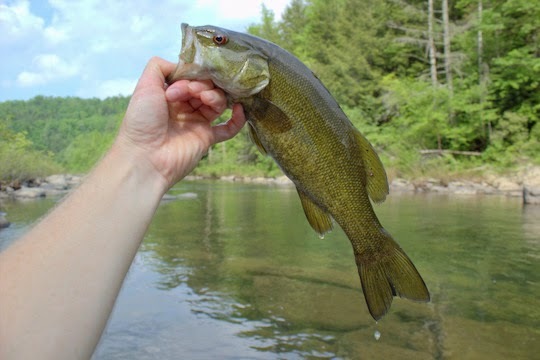 In the past, I would usually take this as a sign that the smallmouth were not feeding very well, but I persevered and kept progressing upstream. Supposedly some musky have been stocked on this local creek so I carried two rods: a four weight rigged with a small Clouser for the smallmouth and a seven weight with a wire bite guard and much larger fly for the possibility of a musky. Most of the water in this stretch is too shallow to be considered prime musky water but I did probe the depths of a few seriously deep pools but to no avail. Either the musky were stocked in a different section or they weren't showing themselves on this day. The insect life along the river was intriguing on this particular trip. 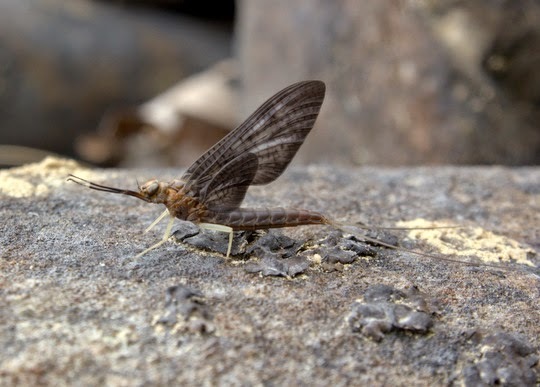 I did not find any golden stonefly shucks yet but the Isonychias (Slate Drakes) are hatching in good numbers based on the shucks. A dun sitting on a rock stuck around to have its picture taken so I shot a few before moving along. The smallmouth started to get active though. As I moved farther away from the access point, the action improved rapidly but of course no surprise there. Towards the top end of the section I like to fish is what I can best describe as a huge boulder garden. Just below the boulder garden lies two fantastic pools where I have seen nice smallmouth in the past. 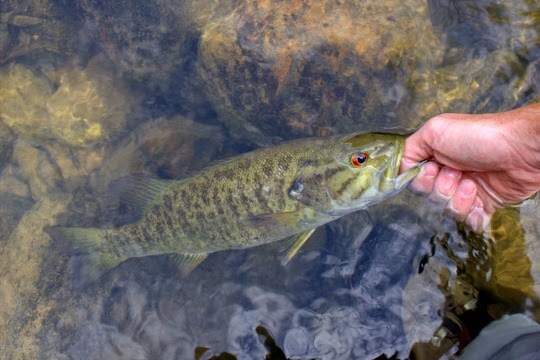 Happy to have already caught a few smallmouth, I was surprised to see a big fish (for this stream) race over to crush my Clouser shortly after it hit the water. Last summer I spooked this fish a few times but never could seal the deal. On this day, things just worked out. 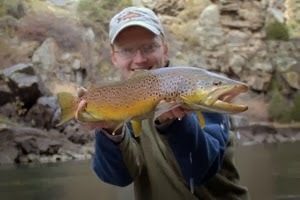 The four weight rod got a serious and unexpected workout, but soon I was admiring a gorgeous fish. Not long after, another nice fish came out of the same hole. 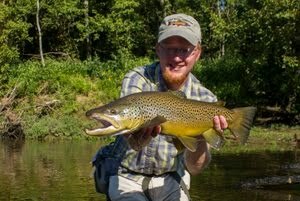 Those two fish ensured that this would be a memorable trip, but I decided to push my luck a little. The Boulder Garden is a section of river that flows under a high cliff face that drops huge chunks or rock into the river. Looking towards it from either up or downstream, it appears that the creek just vanishes into the rocks. One other time, I had scouted a line across the boulders part way through, but since I was feeling lucky, I decided to brave the snakes and other dangers to maneuver through this whole section. Nervously hoping I wouldn't come across a rattler or copperhead, I moved painstakingly through and across the rocks, looking over, under, and around all obstacles before stepping or reaching out with my hand. Finally, I was through! A whole new stretch of water opened before me, flowing away into the depths of wilderness. Few people ever see this stretch, and I guarantee that the fish are some of the most unpressured in the area. The fishing was accordingly very easy. I spotted a nice bass holding near the head of a pool. One cast, three quick strips, and it was fish on. This must be what it was like to fish these streams 200 years ago. In addition to the fishing, I had to document my progress. The camera was employed in taking some shots of the beautiful scenery. Looking upstream, the water beckoned to further exploration, but that would have to wait for another day. The shadows were growing longer, and I don't like pushing my luck on these remote waters. If you head out too late, I guarantee you will find more snakes and other critters. Lots of fresh hog tracks lined the stream, and I didn't care to spook a herd of those either. 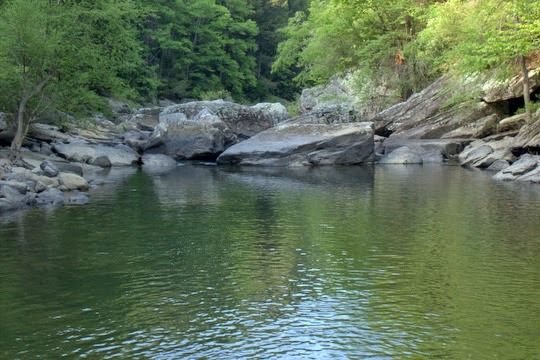 Back at the car, I got the usual strange looks from the locals at the swimming hole as I wandered out of the woods in camo carrying two fly rods. This time, however, I was spared the usual question of "Are there trout in here?" My Boulder Garden adventure is hopefully the first of many. I'm excited to see what other adventures are in store for me there! Nice! Smallies are just the greatest, aren't they? They are definitely hard to beat! 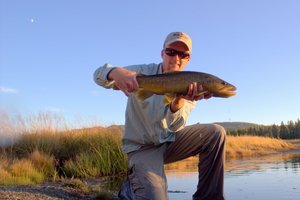 The lack of smallies is Montana's only real shortcoming..... I would love to beam myself to that creek for an overnight trip! Bryan, if you are ever down this way give me a holler and I'll show you some local favorites. You would definitely enjoy them!